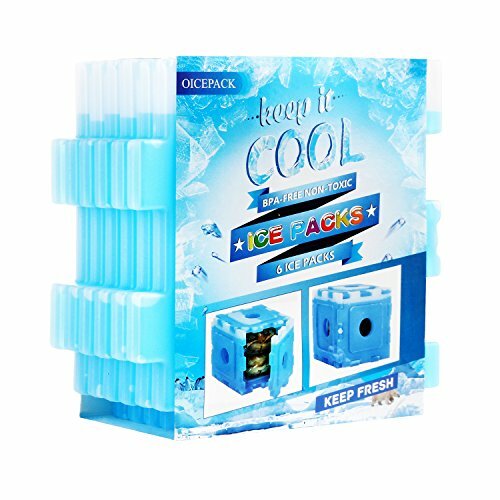 For use:OICEPACK ice packs can be used in food refrigeration, outdoor travel, camping activities, parties, short trips to the outdoors to help you store and transport beverage food. by the contents and environment of the box. About the product: do not open the seal mouth to avoid the leakage, the freezing time is short, the storage is much higher, the service life is prolonged, and the children are safe to drink. About quality: export quality, non-standard inferior products, product strong and durable, safe and hygienic, quality assured. ★Widespread use: great ice packs for daily bento boxes,our ice packs provide you with a need to stay cool on any occasion,children brought to school lunch boxes, offices,outdoor camping, parties, beaches. ★Keep cool: freeze ice packs for many hours to keep food fresh and drinks cool,this can give you a different cool feeling on a hot summer day. ★Simple design: Lightweight, portable, you can build your favorite graphics using these jigsaw ice packs,pack our OICEPACK packs into lunch bags, lunch boxes, and tote packs to keep the food fresh, and combine them for greater cooling. ★Safe and durable: OICEPACK ice packs with 100% bpa-free, non-toxic materials, used safe.sealing mouth design, no water injection, can be used repeatedly,Hand wash only. If you have any questions about this product by OICEPACK, contact us by completing and submitting the form below. If you are looking for a specif part number, please include it with your message.